Each of our buildings has to be a step ahead of all others. Now it’s Visionary. 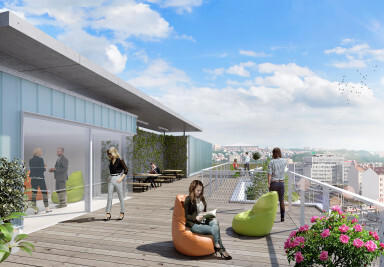 We situated Visionary in Prague 7, one of the most dynamically developing districts in Prague. It is popular with companies for its convenient location and many attractive neighbours. Attractions include Stromovka Park, Holešovice Market with a farmers’ market and a popular Vietnamese bistro, or contemporary art in La Fabrika, The Trade Fair Palace, DOX, or Jatka 78. Nádraží Holešovice station is located in the immediate vicinity, providing access to all types of public transit. Aside from the metro, trams, buses, and trains, in the summer Visionary’s tenants will also be able to take the nearby ferry to Karlín. Blanka Tunnel will take you to the city centre in 15 minutes. And cyclists will also find all they need in Visionary. Visionary is situated on the corner of two busy streets, Plynární and Argentinská, through which 50,000 people pass daily. So your company will definitely be visible. By moving to Visionary, you will gain not only offices, but also the ability to address tens of thousands of potential customers every day. Ecological sustainability means taking into account future needs. For many years now we have thus taken great pains to minimize the ecological footprint of our projects. The Visionary Building aims at LEED Platinum certification, which is the highest possible energy efficiency rating a building can attain. A pleasant environment motivates workers to perform better. Visionary not only ensures that employees have ideal working conditions, but also fun. 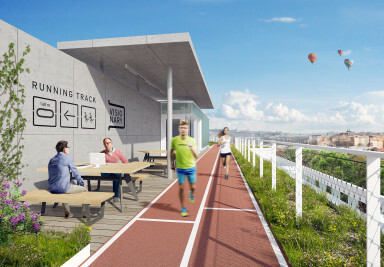 It will become the first building in the Czech Republic with a running track on its roof. People will also be able to get their blood flowing on the adjacent sports field. A restaurant and café will provide a place for lunches and meetings with clients. Terraces with a view, including of the Botanical Gardens, will also leave an excellent impression. Visionary represents the best of contemporary construction trends. 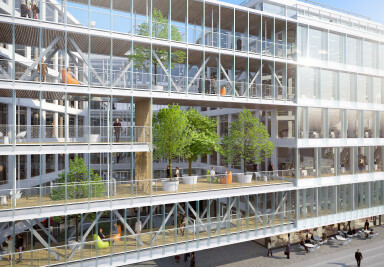 Thanks to its glass façade, it makes full end effective use of natural daylight. Within the context of nearby buildings this striking landmark has a light and clean feel. Visionary will thus become an ideal, representative home for your company. Visionary’s layout is reminiscent of the letter H. Its seven aboveground floors have a total area of 22,805 m2. It also features 214 parking stalls on three basement floors, including an intelligent parking system and six high-speed elevators. So that Visionary’s residents can make full use of its unique aspects, we developed a special mobile application that provides access to all services in the building (for example borrowing an electrical car, or a self-service laundry). It also serves as a useful neighbourhood guide. Skanska Property's bet on Holešovice paid off. Developer managed to lease majority of the under construction Visionary office building near Nádraží Holešovice. Similar to Karlín, Holešovice district is becoming a hub full of development of new offices and appartments. New government district may become reality in Bubny. 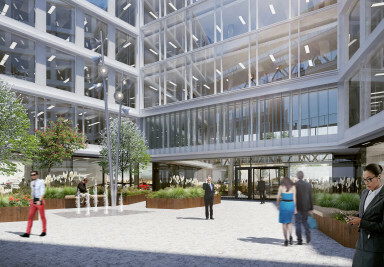 Developer Skanska Property comes up with new innovations regularly. Their office building Visionary in Prague's Holešovice will, as a first one in the Czech Republic, have a running track on the roof with 140m. No other administrative center offers that kind of modern convenience and it is quite unique also worldwide. 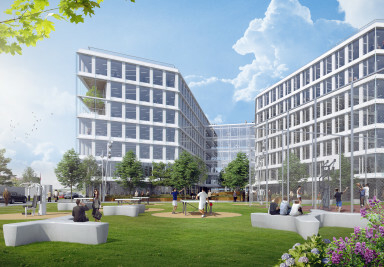 This spring, the developer Skanska Property plans to start a construction of an office complex in Prague's Holešovice. 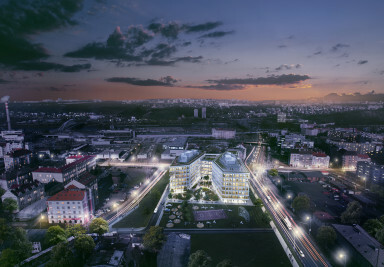 Project called Visionary will arise on the corner of Argentinská and Plynární street. Instead of an old factory for prefabricated concrete segments, there will be a new riverside part of Prague 7 behind Nádraží Holešovice. New owner of the project is Skanska Property. A district with trumendous potential that differs from the rest of the capital. That is how Holešovice district is seen and it is a true challenge for developers thanks to its industrial character. Developers want to stick out. 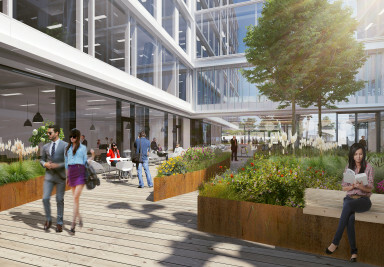 Healthy offices are the currrent trend. 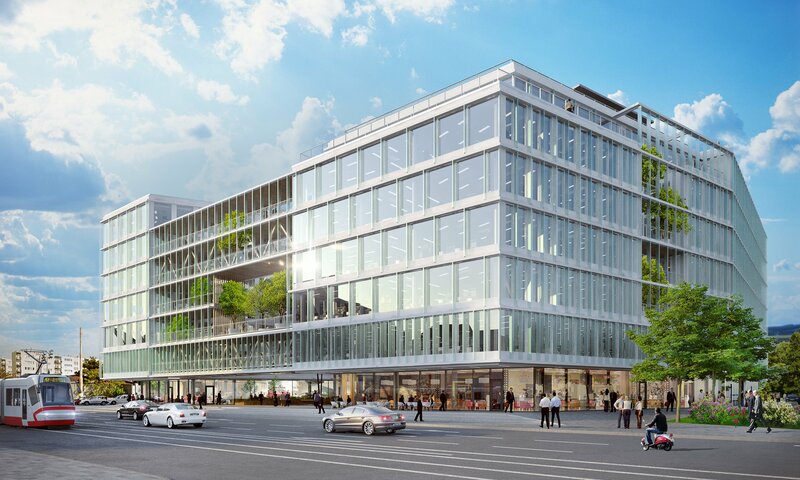 In the Czech Republic, first office buildings with the american WELL certification, are being built. WELL complements the well-known LEED and BREEAM certifications that evaluate technical and operational aspects of the building. In addition to that, WELL is focused on the users of the building - their needs, health and well-being. The atractivity of Holešovice as a business location is rising lately. 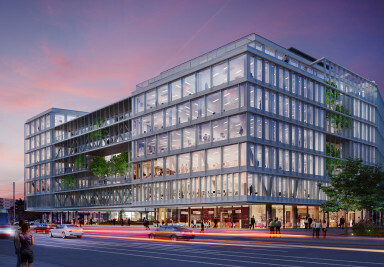 The consultancy company Accenture will move to this part of Prague next year and they will move hundreds of employees from two other headquarters in Butovice. Pop out from work to run on the roof and quickly get back. This will be a new reality for the employees sitting in the newly arising building called Visionary in Holešovice. There will be a running track directly on the roof! CA Immo Real Estate Management Czech Republic s.r.o. We’re the Visionary team. We’ll be glad to give you more information. But first we have to ask you whether you use office space or retail premises for your business? Thank you, now we know everything we need! We’ll contact you as soon as possible.